Day 3 - muloorina homestead to Maree 52.7km. Photo Matt Newton Rummin. We were attempting something that had never been attempted before. The first journey, under purely human power, from Australia’s lowest point, Kati Thanda - Lake Eyre (-15.2m), to the continent’s summit, Mount Kosciuszko (2228m). Cycling over rough terrain, through deserts and up mountains for a distance of 2152 kilometres would be a hard enough for anyone. However, what made it more challenging for this team was the fact that it’s five members had significant disabilities. Walter Van Praag has cystic fibrosis and only thirty-eight percent lung function, Duncan Meerding is legally blind, Daniel Kojta has paraplegia and so pedals with his hands, Conrad Wansborough lives with chronic pain after a spinal injury and I have hemiplegia with associated sensory processing issues. Our saviour Torsten welding the tandem. The expedition tagline was “What could possibly go wrong?” Well when I fell out of the back of the support vehicle and cracked two ribs on the drive to the starting point, and when the troopie hit an underpass with a tandem trike on top. it seemed like everything was going wrong. The trike was wrecked - the frame was snapped in three places, the handlebar broken off and the luggage rack smashed. A tandem is the only vehicle that Duncan can ride, being blind, and me having balance issues, a trike is the only cycle I can ride. So, how were we going to ride 2000km now? This shakey start to the expedition was all being filmed by Rummin, a Tasmanian production company, who were documenting the journey - I had previously worked with Rummin on the film Doing It Scared (2016) about my return to the Totem Pole after an accident there in 1998 left me with my disability. They were delighted (if a little worried) when we found a bush welder, to weld the tandem back together in Hawker. The Route. Top left Kati Thanda - Bottom right Mount Kosciuszko. Kati Thanda is a sacred place to the Arabana people who asked us not to venture out onto the dry Lake’s surface and we did not want to begin this ‘white-fella walkabout’ on a bad note, so readily agreed. We would begin at Peake Jones Point at the southern end of Lake Eyre North. I was supposed to be riding the tandem with Duncan but, being in great pain, was relieved by Conrad for the first two and a half days. Dan was riding his funky hand-trike and Walter rode a fat bike. The ‘washboard hell’ road made it tough going from the outset, so the L2H team made only 20km that first day. The second day Daniel opted out as his sternum was bruised: the hand-trike requires steering with the chest and the heavily corrugated road was paining him greatly. Walter led the team on his ‘Fatty’ and pulled into Moolarina Homestead in the early afternoon. As we suspected the first leg was proving that it might actually be the crux of the whole ride. On the third day every member of the team made a start and we progressed well averaging 10km/hr on the dirt road. As a headwind got up this momentum was a struggle to maintain. 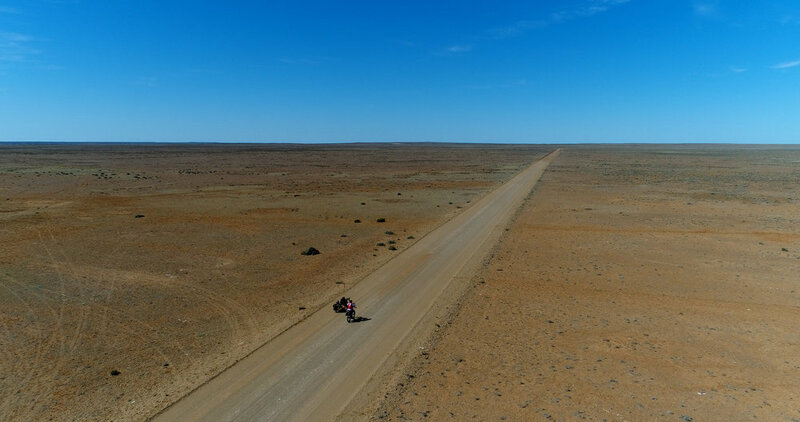 Matthew Newton of Rummin was shooting some spectacular footage, which included the trikes passing a wedge-tailed eagle feasting on road-kill. The Team L-R: Conrad Wainsborough, Dan Kojta, Nati the Dog, Ed Homan, Duncan Meerding, Paul Pritchard, Walter Van Praag. Dan had been suffering with ill health, complications due to paraplegia, for a few days and the difficult decision to evacuate him was made at Lyndhurst. Ed drove him to Quorn Hospital with a suspected kidney infection where he would spend the best part of a week. He became paraplegic a number of years ago when a shipping container fell on him and literally folded his body in two, backwards (he described peering behind him and scraping his nose on the heel of his boot). The rest of us continued south to Leigh Creek on baby’s bottom smooth sealed road were we sped along. What a joy after ‘Corrugation Street’. We talked to forty kids in the school there, and challenged their notions surrounding disability: we are not poor victims in need of help, as many (adults admitably) see us, nor are we heroes succeeding against overwhelming odds; we are just people, ordinary people, working with what we’ve got; as we all do. But there was a lot of excitement and laughter when we asked the students to play a disability simulation game: open a Mars Bar with one hand behind their back and without using their teeth. The students we talked to throughout the trip were mature enough to get what we were saying, but usually enjoyed sitting on our crazy contraptions a whole lot more. Matthew and Jeffrey of Rummin and Duncan at an outback bar. As we were climbing a particularly rough hill up to Blinman in the Flinder’s Ranges the back wheel on the tandem seized. There was no other choice than to call Greenspeed and order a new one. 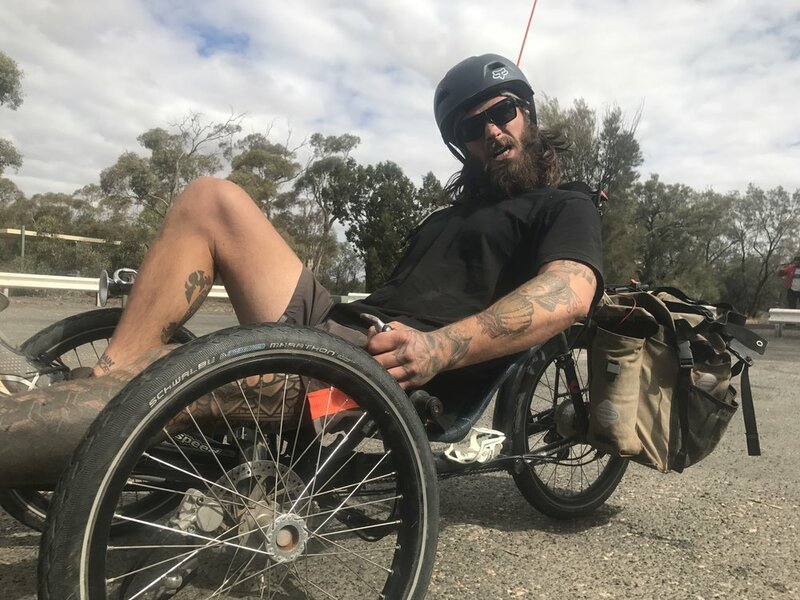 As this could only be posted to Broken Hill, about ten days away, we resorted to cannibalising Conrad’s trike for the back wheel. From now on he would ride Walter’s emergency bike. Conrad was proving his worth at fixing bikes and from that moment on became the expedition mechanic. In the Flinder’s Dan returned and it was good to see him back to his old self. The reactions to the team from the broader public were noteworthy and, as one of the reasons for venturing on this ride was to challenge common misconceptions, they were of great interest. For the most part we had positive responses, such as the shearer who had Duncan touch the wool of a sheep to feel what it was like. But we still faced institutionalised ablism on an almost daily basis - be it the camp site owner who came up behind Dan, who was in his wheelchair, and tucked his shirt into his trousers without asking (we all fell about laughing when Dan told us this). Or the assumption, by many people that we were unable to take care of ourselves. Rumours even got back to friends and family in Tasmania that we weren’t being ‘looked after’. However, mass hysteria was averted by some timely phone calls. Steve Findlay accompanied us on the first half and was a great help. From the Flinders Ranges the team would head out East on the most remote leg of the journey, being accommodated in shearing sheds. All we encountered was kindness from the musterers and shearers, well, and severe headwinds on the dirt road to Curnamona Station. Unfortunately, the gears on Dan’s drive wheel stuffed up so he would now ride in the troopie unto Broken Hill. Dan was not having the best of luck. We hit the Barrier Highway at Yunta and had to do battle with road trains and kangaroo carcasses for three days east. Duncan renamed it ‘The Highway of Death’ because he would gag every fifty metres when we approached a corpse of a ‘Big Red’. Duncan lost his vision when he was in his late teens to an unpronounceable genetic condition. After a decade and a half he now has a successful lighting design business in Hobart were he may be the world’s only blind lighting designer. But, it is a testament to his dexterity that he still has all ten digits. Medic Vonna was worth her weight in gold. Here she helps Duncan fix a cleat in Barmah Forest. “So, you’re like the X-Men but shitter”, one kid said to us in Broken Hill about three weeks into the trip. We had only had one rest day, and our cycles were in desperate need of repair. Ed felt like Mosses guiding the blind, the crippled and insane out of the desert and into ‘Big W’. It was a strange experience for us, and possibly the other customers, seeing five dust laden, dirty, mangled bodies limping and wheeling through the air-conditioned store. From Broken Hill we rode the delightful Silver City Highway from barren desert to the lush Murray Riverina. Walter cried when he laid his eyes on vast groves of oranges, avocados and tree nuts, and of course vineyards. At Wentworth Vonna Keller joined the team as medic. From here, we would follow the course of The Murray for 1000km up until Tom Groggin on the Alpine Way. Speeding motorists made this the most hazardous part of our journey. We found ourselves taking long detours just to avoid the exceedingly dangerous Murray Valley Highway. Not wanting to lump all motorists into one basket but the members of the team on trikes (trikes take up more of the road) copped abuse on a daily basis. The tandem crew in Yarawonga, one of the Murray towns. Photo: Walter Van Praag. At Echuca we had a rest day andit was a real treat to meet up with family. There were wondrous moments along the Murray as we crossed in and out of Victoria and New South Wales several times a day. At times the team would split up and take different routes according to their modes of transport. The tandem for instance was up to four times as fast on metalled road surfaces, whereas the dirt roads along the river bank were more scenic and ideal for the hybrids. Along this leg of the journey the L2H team were riding over 100km a day. Upon reaching Albury we took a rest day at the Big 4 and continued along Lake Hume. Not far along the lake, with it’s skeletal trees poking out of the still water, the landscape changed from flat Riverina to alpine foothills. Once the lake was behind us we had our first view of the mountain. And what a view! Still dressed in it’s winter coat of snow and seemingly hovering above yellow canola fields, we wondered how the hell we were going to ride up there. Lucky for the skiers, but unlucky for us, it was the best spring snow in Kosciuszko’s recent history. This prompted the team to make several frantic phone calls: one to the National Park office, who told us there was eight meters of snow on the mountain. We then called people asking them to lend us the mountain gear we lacked, such as ski poles and snow shoes. Above Khancoban, on the huge hill past the Snowy Mountain Hydro Dan started feeling unwell again and vomiting uncontrollably, so medic Vonna made the wise decision to have Ed evacuate him to Corryong hospital. The rest of us went on with an emergency shelter and food. Once we had summited the pass came the best descent of our lives, a narrow winding road carving and dropping through many tunnel-like cuttings. Walter with his O2 saturator. The team reached Geehi Flats. We had cited Tom Groggin as the days final destination, knowing that the next day, up the steepest hill in Australia, to Dead Horse Gap, would perhaps, be the toughest of the trip. However, with the delay caused by the evacuation of Dan we would now have to climb another pass to arrive at Tom Groggin, and then two more to get to Dead Horse and down to Thredbo. As it was, Wally and I were fatigued and we voted to camp at Geehi. We prepared everything the night before, lunch, water, checking bikes and trikes, and departed at 7am the next day. The team soon became scattered with Conrad and Vonna a few kilometres ahead ahead of Duncan and I, and Wally, preferring to start later, after his morning nebulising session, was fetching up the rear. Ed waited every five kilometres for the group to pass as, after nearly forty days on the road, we were becoming extremely fatigued. Thredbo was a mere twenty three kilometres away, though for a man with cystic fibrosis, a hemiplegic and a blind guy often travelling at two kilometres per hour, it might have been a world away. After a pasta lunch and a litre of Hydrolite we took on the second and toughest of the three passes to be crossed that day, Leather Barrel. With gradients of up to 17% all of the team had to dig deep. At points Duncan found he could increase the speed of the tandem by dismounting and pushing while Paul pedalled and steered. Walter, having only 38% lung function, was forced to use his oxygen saturator; he looked rather out of place cycling up the steepest hill in Australia with plastic pipes going up his nostrils. Paul and Duncan on Leather Barrel. Walter was diagnosed with cystic fibrosis at age eight when it became obvious he wasn’t your average kid; skinny arms, pot bellied and always coughing. We nicknamed him Darth Vader because of the sound of his nebulising each morning and night. We reached Leather Barrel Creek and after a brief rest set off for Dead Horse Gap. This last pass was mildly lower angle but, still 10km of serious uphill. The first snow was a drift at Siberia, just short of the gap. The tandem team touched it and had a moment to appreciate just how far they had come since the salty surface of Kati Thanda all those weeks ago. Duncan and I at Dead Horse Gap. Photo: Kirsten Seaver. After a day of rest at Thredbo the team headed down Crackenback and into Jindabyne. The next morning we embarked on the last pedalling day of the trip - from Jindabyne to Charlotte Pass. This was another twelve hundred meter climb. We cycled up into the snow with Matt Newton’s drone a constant companion. The gate at Perisher was opened three hours before we arrived there, thus allowing us to cycle the remaining 12km up to Charlotte Pass. The spring melt was well under way. Nevertheless there were snow banks by the road side several metres deep and cornices overhanging the outer bends of swollen silver streams. The whole scene was one of magic. Charlotte’s actually felt like the end of the trip, as the snow would prevent us cycling the last 9km to the summit of Australia. From here we would have to trek. Lachlan, the resort owner, opened to door to the staff quarters and after a dinner of high protean salmon, we crashed out and arose at 4am. We had decided on an alpine start so that the surface of the snow would be frozen enough to support our weight. The pools of head torch light revealed a crusty solid surface as we trudged through the darkness. Walking was a struggle after 42 days sat down; it was as if we had forgotten how to do it. By the time we had reached the Snowy River we were in a wonderland of alpenglow and the dawn had scattered twinkling diamonds on the carpet of snow. We had given ourselves the turn-around time of noon but it was barely 8am when we paused at Seaman’s Hut to sip warm sweet tea. We were still walking on top of the crust up until Rawson’s Pass where we saw the tops of bike racks poking farcically out of the snow. This should have been the high point of our cycle journey, just 1.5 kilometres from the summit. From here we took a traversing path across a snow field. The time was approximately 10.20am when we trickled onto the top of Australia, Vonna and Ed, or the TABs (Temporarily Able Bodied), as we called them first, then Conrad and I followed by Duncan and Walter. We all got very emotional. The strain of keeping it together for 42 days, and suddenly being freed, was as though a levee had broken. We all shed tears and then it was time to take interviews from local and national radio, and Kirsten Seaver of the Monaro Post who came snow shoeing over the summit as we sat drinking whisky that Duncan’s grandmother had given us. We toasted ourselves, but more-so Wally who was the only member of the team to ride uninterrupted for 2152km from start to finish. We joked that he was our Tenzing, and that all our hard work was just to put him on the summit. The summit of Australia. Note Conrad's Wellington Boots. You may notice only four of us on the summit. Dan was in hospital still but is well now and vows to return. When it came time to descend, the snow had turned to slush in the heat and we all had a difficult time wading through what amounted to a metre of soft serve ice cream. Wally’s head turned purple as he kept on chatting to Kirsten and forgetting to breathe. We hit the car park in the late afternoon and a four year dream had become a reality. Not only had we achieved the first journey from the lowest point to the highest point of the Australian continent under human power but, much more than that: we had shown that people with disabilities are capable of world firsts, not just ‘first disabled challenges’. And I think we had shown that there is actually no room for the term ‘disabled’ in todays society. Differently-abled maybe. We all face our own peculiar challenges. Our profound thank's must go once again to World Expeditions for their support of this venture. It would not have been possible without your help. 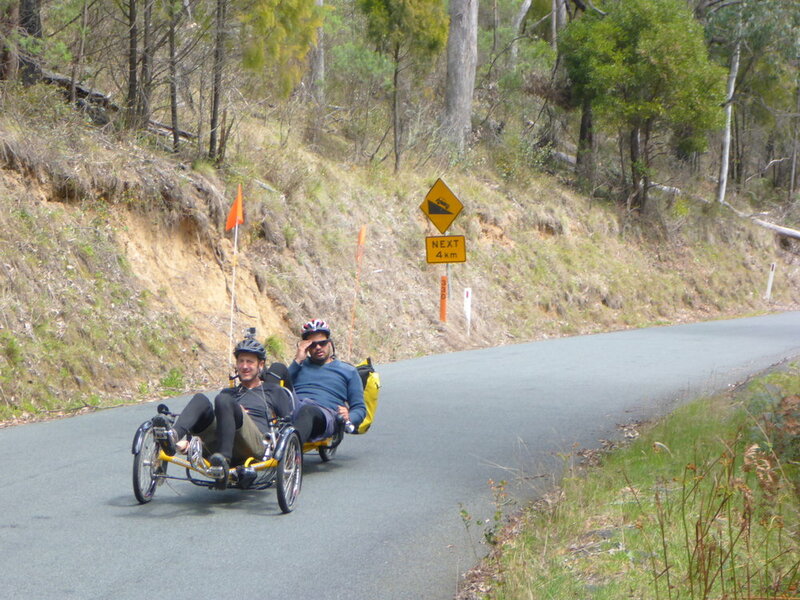 Also we are exceedingly grateful to Greenspeed Trikes, Mountain Equipment, Keen Footwear Australia and the host of Expedition backers the full list of whom is available at the Lowest to Highest website. Lastly huge thanks to our Pozible backers for the L2H film and Rummin Productions for believing in us. The film is looking sensational! I will keep you posted on this site too.